Oh my gosh! I went solo for preschool storytime and I survived. 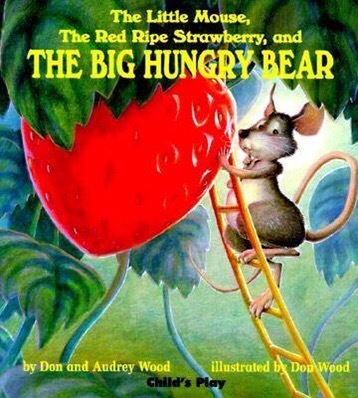 I brought out one of my grandson’s favorite books The Little Mouse, The Red Ripe Strawberry and the Big Hungry Bear by Don and Audrey Wood. What a great way to draw in the listener. The reader speaks directly to a young audience by asking , “Hello, little Mouse. What are you doing?” The simple text and large colorful illustrations encouraged childen to make predictions and discover cause and effect relationships. Of course any storytime should include partcipation and what better way than going on a bear hunt. 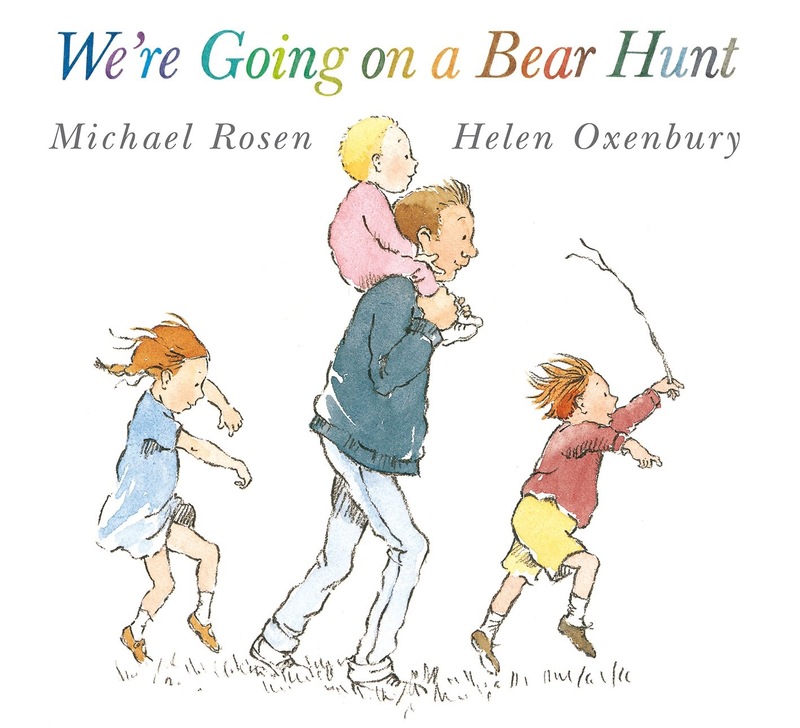 I discovered a youtube Kidboomers musical version of We’re Going on a Bear Hunt by Michael Rosen and adapted the lyrics. Using the flannel board for pictorial representation we explorers encountered swishy grass, squelchy mud, splashy water and then stepped, stepped, stepped into the library to find a bear puppet which read Room for Bear by Ciara Gavin. The flannel board activity reinforced the concepts of over, under, through and into as the children chanted along. 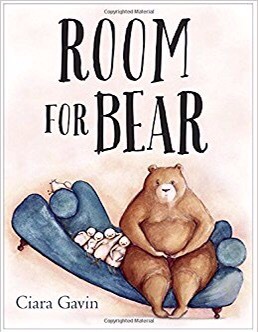 Room for Bear tells the story of a bear who tries to live with a duck family but unfortuantely “what suited the bear didn’t suit the ducks and what suited the ducks didn’t suit the bear”. So bear leaves to make his home in a cave. Bear misses the ducks and the ducks miss bear. The story ends happily with bear building the ducks a new home inside his cave. Short sentences combined with engaging illustrations kept the toddlers interest as well as generated questions about how families can be made up of all colors, shapes and sizes. 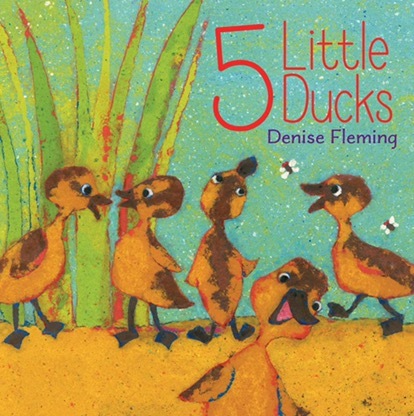 Room for Bear was the perfect transition for 5 Little Ducks by Denise Fleming. I used the flannel board again to visually interpret the song Little White Duck written by Walt Whippo and Bernard Zaritzky. I orginally had a Burl Ives CD with the song to which my grandchildren listened over and over. If you enjoy Lois Ehlert books you will want to visit Denise Fleming on the web. She uses pulp painting as a medium to tell the nursery rhyme 5 Little Ducks but there’s a twist. Instead of Mama duck calling her little ones back, it’s Papa duck. The ducklings explore different environments and meet new animals as they travel over the hills and far away. What makes this an engaging read for young ones is discovering the places Papa duck is concealed while keeping watch over his family. The simple repeated word structure and bold colorful illustrations helped guide children in productive talk. Storytime was a fun experience for me as I met new authors and became familiar with early literacy techniques. As with all storytimes it’s time to say goodbye and put our books to bed until we meet next time.